Noumena, a prominent Finnish melodic death metal band, will release their fourth album Death Walks With Me in April. After a couple of years in hibernation, the band is ready to show they are masters in combining the best ingredients of the genre with a peculiar recipe. The new album is loaded with heavier and more versatile music than ever before in the band's history. Noumena is bold enough to fulfil their musical visions no matter how unorthodox those might feel. The variety of instruments heard on the record is wider than usually in heavy metal, ranging from a French horn to a mandolin. 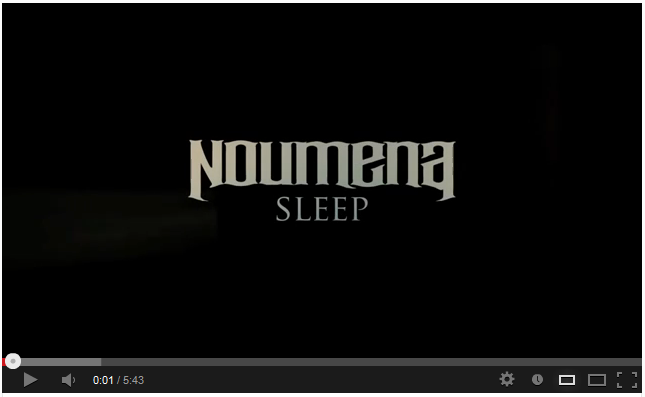 Besides the new influences, Noumena sticks with their trademark features. The album is woven from catchy and melancholic melodies, aggressive and tranquil moments and both natural and groovy sounds. Noumena won't participate in the loudness war but offers quality sounds instead of overboosted and overproduced soundscapes. The album is recorded, mixed and mastered at D-Studio, Klaukkala Finland, by Jarno Hänninen. Thematically, the album revolves around death and loss. Lyrics reach from historical atrocities and philosophical ponderings to the moments of losing a close person and friend. But the inevitability of death makes life worth living; the songs offer moments of love, devotion and friendship, too. Death Walks With Me also introduces the new member of Noumena: Suvi Uura. She is a talented and many-sided musician, who brings a final touch to Noumena's sound and live action. Suvi's vocal delivery is wide and deep, from touching and tender singing to brutal growling! Noumena has released three albums, Pride/Fall (Catharsis Records 2002), Absence (Spikefarm Records 2005), Anatomy of Life (Spikefarm Records 2006) and one digi EP, Triumph and Loss (Spikefarm Records 2006). All have gathered praising comments from fans and reviewers alike. Every album is sold out at the moment. Noumena has played loads of gigs in Finland and toured twice in Central Europe (Germany, Austria, Czech Republic). After the release of the new album the band will the road again. Noumena was established in Ähtäri, Finland 1998. What better way to celebrate the 15th anniversary than to release an earthshaking metal album? После 7 лет молчания славные финны Noumena разродились своим четвертым студийным альбомом. Что же, похвально. Главное, чтобы ожидание стоило того. Включаем, слушаем. Хорошо, хорошо, очень хорошо. Так, закралось какое-то странное ощущение - это какого года альбом вообще? На диске значится «2013». Странно, а звучит группа в духе конца 90-х. Вот так вот - Noumena удалось записать совершенно ностальгический альбом с фирменным финским звучанием и колоритом, каких уже и не встретишь в современной мелодично-экстремальной музыкальной нише. Очень интересные с музыкальной точки зрения финские метал­листы NOUMENA существуют без малого полтора десятка лет, за которые испытали все прелести жизни простой рок-группы - да такие, что о них давно уже не было ничего слышно. Тем не ме­нее, после практически семилетнего молчания в свет вышла их новая работа, «Death Walks With Ме». О том, что нового произош­ло за это время, а также о группе и альбоме нам поведал бас-гитарист NOUMENA Ханну Саволайнен. Смерть всегла следит за нами и подкрадывается сзади. К сожалению, дать интервью она отказалась (слишком много работы), зато посоветовала финнов NOUMENA с их новым альбомом “Death Walks With Me”. На встречу со мной вышел светловолосый парень с факелом в руке и мы начали ходить по лесам Финляндии и даже говорить о профессиональном пении, клавишных гармониях в музыке, и смерти.